A couple of months ago now (time flies!!) we spoke to David, and now it's Yann's turn. :) Yann Fougere is the other half of Bon Macaron, and he's shared some of his own favourite "food things and French things" as well as his story of coming to Canada and opening Bon Macaron. What's your favourite part of France? Paris. It has to be Paris. I mean, France is so different from region to region. I haven’t been to the East much, I should because my grandmother is from there, but I’m more into the South, where David is from. Both the South East and the South West. The food in the South West is amazing, and you have the surfing. I used to go camping there with friends around when I was finishing high school. But Paris is just something on its own. I’d say the centre is my favourite, the area around Notre Dame. You have the Marais on one side, Saint-Michel on the other, there are tonnes of small restaurants. You can walk forever. There’s always something to do there, whether it’s exhibitions, movies, parties, whatever you feel like. And the Jardin du Luxembourg—I used to call it my garden when I was a kid because I would go there and play soccer with my friends and with my Dad all the time. As far as restaurants and cafes, there are loads of small places that have been there for a long time. There’s one next to where my parents live, a wine bar. The advantage of wine bars in Paris is that, while the menu is going to be smaller, you know that it’s been made in-house. You don’t have twenty different items to choose from but what they have, they know exactly where it came from. My best friend there owns one, Comme Chai Toi, and when you go there, the menu is written in chalk and it depends on what they’ve found that day. And it’s right next to Notre Dame so you get the view, too. What do you miss as far as food and what do you like to cook here? How did you end up over here in Victoria? I graduated from high school in Paris and decided I wanted to see a bit more of France, so I went to the South for a couple of years and started my business degree there, which is where I met David. I had the opportunity to transfer, which allowed me get my bachelor’s degree from two universities. I thought about going to Montreal but I wanted to be able to practice my English. And I didn’t want the minus forty degrees. UVic has an entrepreneurship program that they’re very well known for, and which sounded really interesting to me. So I came to UVic for my last two years. It turned out I was able to do an exchange from there, too—so I did six months in Hong Kong. And then I took the co-op option. I looked all around the world for programs, which lead me to Namibia, where I spent six months taking care of public relations for the National Art Gallery there. And then I came back to do my last semester at UVic. And what lead to Bon Macaron? Just as I graduated, the cafe where I was working, Vieux Montreal, closed. So I had to find a job. My parents basically told me, "If you’re staying over there you’d better find yourself a job, we’re not going to be paying for your condo." I actually worked at Macchiato for a month and a half, and then customers I knew from Vieux Montreal heard that they were looking for a manager at Murchie's. They introduced me to the chef, who’s also French, and we got along really well. I stayed at Murchie's for four years. They helped me get my permanent residency. They had so many different pastries but when they started selling macarons I noticed how popular they were. And I realized the flavour possibilities were literally endless. David and I wanted to start a business. We had thought about taking over Vieux Montreal, but there are so many products with a full bakery and so much knowledge you need to start with—the different breads, the croissants—and we wanted something where we could have complete control of the process, and run it easily with just the two of us. It took a while to find the right location and for everything to happen, but then it all came together at once: we got the property, my permanent residency came through, and we were like, ‘Ok, let’s go for it.’ We thought that we’d be busy that first December and that January would slow down, but at the beginning of January we got the cover of the business edition of the Times Colonist. The Saturday it came out… everybody came in that day. And that triggered quite a lot of press. CTV News came and shot for their Monday segment, we did a couple of CBC radio spots. Eat Magazine, blogs, all these people started mentioning us and that really got the ball rolling. 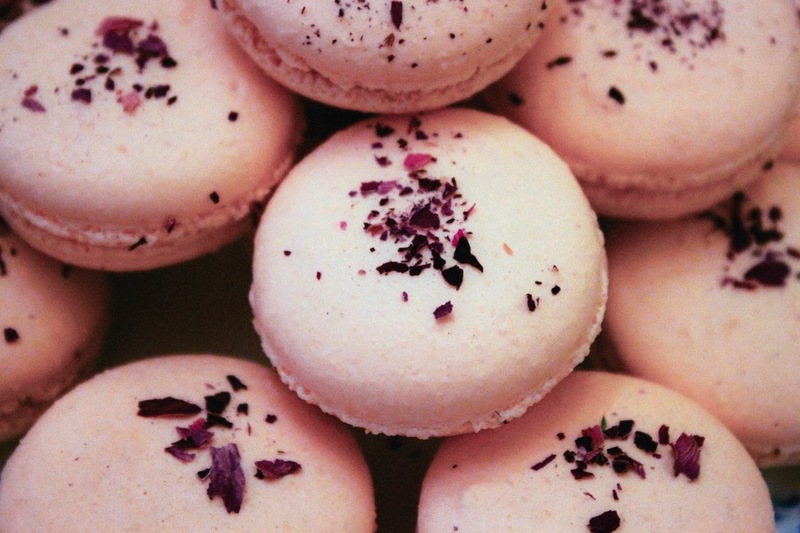 And now Bon Macaron is expanding to Vancouver, which is very exciting! Do you see macarons when you close your eyes at night?? It’s not even just the baking, it’s what recipes I have to make, what’s getting low, what ingredients needs to be ordered, what orders are going out—we’ve been getting a lot of big orders lately with weddings and baby showers. I have dreams about it all. One of our most popular macaron flavours is Earl Grey. And one of the reasons it's so delicious is that, as with all our macarons, we sought out the best ingredients. In this case, that means using the organic, fair trade Blue Sapphire Earl Grey loose leaf tea that's blended in-house by Venus Sophia Tea Room & Vegetarian Eatery. 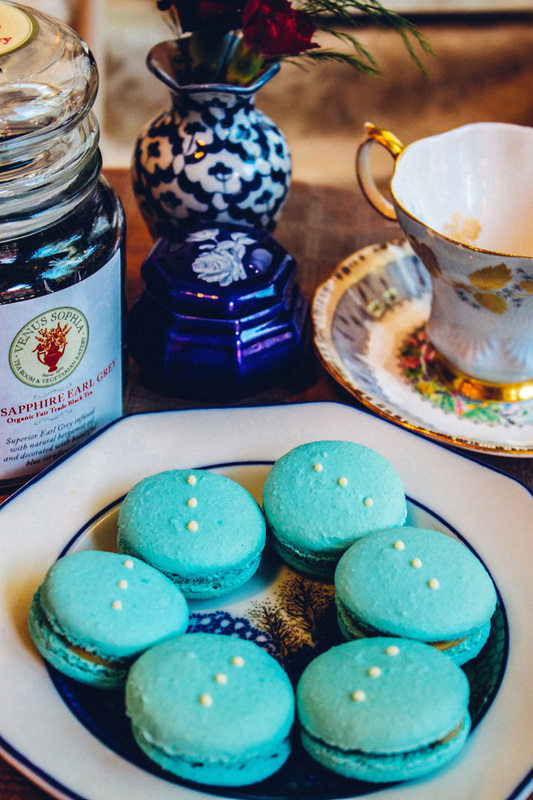 We also make a custom macaron for Venus Sophia's popular afternoon teas, using their Afternoon Tea Blend! Working with the community—and with other local businesses who care about quality as much as we do—has been a priority for us since day one, and the result of this partnership has been some truly lovely macarons. We popped into their tea room, which is in China Town, to talk to Venus Sophia's Sallie El Alaily. "I’ve always loved teas; I was always into very high quality teas. So of course I had to bring that into my own business and that’s given me a huge opportunity to really take things to the next level. I have the pleasure of working with the finest suppliers and tea gardens and I've tasted hundreds of teas over the years, which allows me to carefully select the best teas, herbs and botanicals for our tea line. And it never stops. I'm also studying to be a certified tea sommelier while running our business, it brings me so much joy. "We change our Afternoon Tea seasonally—summer, spring, fall, and winter—we always try to keep it fresh and different. 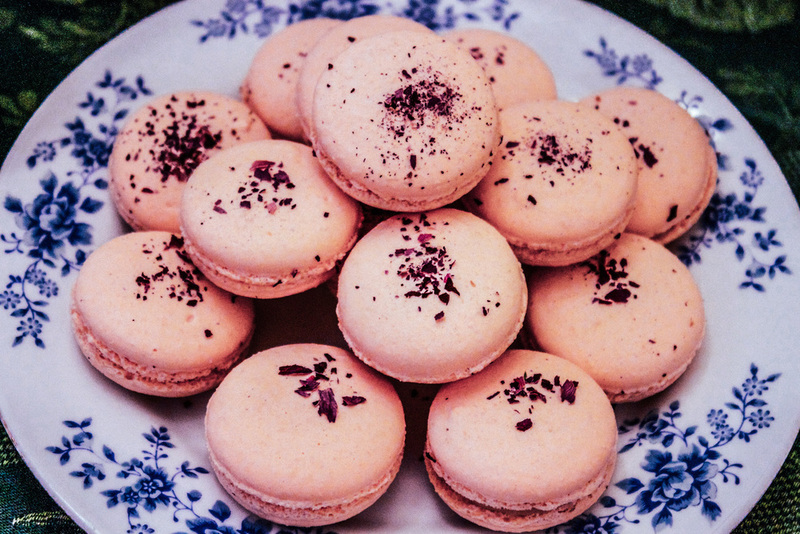 It popped into my head that we just had to have a macaron on our afternoon tea menu. Alain, my husband and business partner, is in charge of the kitchen at Venus Sophia and his hands are full with our extensive vegetarian menu and afternoon tea sandwiches and treats. So we both thought it would be a great idea to collaborate with a local bakery! While looking around town another bakery recommended Bon Macaron—they were pretty new at the time. At first I was using different macarons from their selection and that was great. But then one day an idea again popped into my mind: 'I want my own Venus Sophia macaron!' And I got what I wanted. [laughs] And I’m very happy. It’s great. It’s a beautiful colour. Our customers love it. I love it." "When I was creating the tea I was thinking of a kind of affordable luxury. I’ve always liked jewels and Venus Sophia is all about beauty. I came up with the name and then I thought, 'How do I make that work?' The blue cornflowers we blend in are very much like a sapphire blue. It just adds beauty to the whole tea experience. And it’s not just drinking the tea—when you’re brewing loose tea you get to scoop it out of the tin, etc. It’s the whole process. Those cornflowers also come from a farm very close to the tea garden in Sri Lanka where the this tea comes from, and that was a great connection." "Sometimes I’ll be walking somewhere and something just inspires me, like a certain mood or a feeling, and I think, 'I want that in a tea'. For the Afternoon Tea Blend, which Bon Macaron uses to make our Venus Sophia custom macaron, it was an expression of my love for afternoon tea, and specifically afternoon tea at Venus Sophia. It’s flowery and elegant, distinctive but not too strong. I always like to blend with herb and florals. I just love those. They’re perfume-y and wonderful and good for you." We'd love for our customers to know a bit more about us. So here's the first in a series of posts about our owners and staff—the people who are Bon Macaron: a little interview with owner David Boetti! How did you end up in Victoria? I was born and raised in Cannes, in the South of France. When I was around fifteen I took a trip to Canada with my Mom—every summer we took a trip together. We did the East first and we enjoyed it so much that the following year we did the West. One part of that trip was coming Victoria, and I loved it. It’s really similar to where I grew up. And Vancouver Island is a little bit like what Corsica is for the South of France; it’s not as warm here, of course, but compared to the mainland it has nicer weather, there’s not as much rain. I’ve always liked the island lifestyle, being surrounded by water. I love diving, I love sailing. I just need water. One thing I’ll always remember is, we were walking along the harbour here—I was fifteen—and a big group of skater girls walked by, and started to whistle at me. The second after that I looked at my mom and I told her, “You know what? One day I’ll come back and live here.” I was young, I was a teenager, it was a good experience. But there really was something particular about the island, something about the energy, the feel of the place. I just knew I was supposed to be here. In the end, I came back ten years later, when I was around 25. The main reason was, I went to university in France, and at university I met Yann. He was a year ahead of me, and when I first got there he was leading a campus tour for the new students. I was with my girlfriend at the time and she was a little bit more serious than me, so I had to look serious. So I kept asking Yann questions which he had no idea how to answer. That’s how our relationship started: me really annoying him to show off in front of my girlfriend. It was one of the rare schools in France where you could do all the courses in English, and you had to do two years at the school but you had the option of doing two out of the four years somewhere else. After my first year and a half there, Yann went to UVic—a lot of people that I knew at university moved here—and I already knew I loved Victoria, so it was an opportunity for me to come over. It was just supposed to be for two months and it ended up being three and then four and so on… It was hard for me to leave my mom and my grandma, but I felt in my guts I had something to do here, whatever it was. I guess it was opening a macaron store! But I think there’s really something special about the Island. Everything in my life brought me back here. Yann was one of my closest friends, and out of all the universities across the planet that he could have chosen, decided to come to UVic. What were odds of my best friend coming to the city that I’d fallen in love with ten years ago? And what made you decide to open a macaron shop? The year before we opened the shop, I was scuba diving every day, and I did a course to become a PADI certified instructor. I went down to Mexico for a week just to look at this one sailboat that had so many things engineered for diving, living, and fishing. It was such a beauty. The idea was to buy it, come back to Victoria and get rid of everything, then go back and live on it and sail around Mexico, Panama… But I slept on the boat for one night and I had a dream that I’d wake up ten years later, with nothing, with all my savings having gone into the boat. And I asked myself if that was what I wanted. I have such a strong relationship with my mom. She’s taken care of me all my life, and eventually I want to be able to take care of her. The sailboat plan wasn’t a good one for that. So when I came back to Victoria I sat down with Yann instead. We’d been wanting to do something together for a long time, people had been telling us how well we work, especially when we’re together. And we just thought, what can we bring to Victoria that they don’t have at a certain scale? Yann came up with the idea for a macaron store and we just started talking about it on his sofa, between two Xbox hockey games. I really trust him, he’s a very smart guy. He first started making macarons when he was the manager at Murchie's and now he's always in the Bon Macaron kitchen—the quality of everything we make is really important to us, so it's worth putting the time in there. A lot of people thought we were crazy, tried to warn us against it. When we first opened we worked twelve hour days, seven days a week with no employees. Then we went to alternating Sundays where I would work alone, and then Yann would work alone. And then after five months we started hiring. But after two and half years in business, we’re working on a second store and maybe even a third. So I think that shows some success! What’s one of your favourite places in France? I had the opportunity to go to Corsica pretty much every year in the summer with my mom and grandma. Corsica is French but there are a lot of Italian roots there, a lot of that hot blooded Italian/South of France, Sicilian element. The people that live there have conserved it to a point that you wouldn’t believe. I remember when I was a kid they built a McDonald's there, but the locals basically just refused to let it open. And McDonald's never tried to come back. If you want to live there and build a house, you have to use material from the island, you have to use workers from the island, and you have to get authorization from the Corsicans, but because of them they’ve kept the island without big corporations, without having just anyone that has money come along and build a gigantic house. We rent a place up in the mountains, in an old, French-style village that’s been there for hundreds of years, and we just stay there with the people. It’s good food, good people, but there are certain subjects you still don’t want to talk about there. You don’t flirt with a girl with her brother or her dad anywhere around. Because it’s so traditional though, it’s really well preserved. There’s hardly any pollution, no big trucks. It’s one of the most beautiful places on Earth. What kind of food do you tend to eat in Canada, compared France? What do you miss? I eat a lot of cheese and bread. Things I really miss from France are cheap wine, cheap cheese, good cheap bread, and good foie gras. I miss a lot of the restaurants in France, too. When I go back I always go to this one place that’s about an hour and a half from our home in Cannes. It’s in a small village up in the mountains. You go and you sit, and the first thing they do is bring you a big bucket of butter, and unlimited cheese and pâté. That’s what you get for just sitting down. You haven’t ordered anything yet, not even wine. By the time you get your food, you’re not hungry, but you eat it anyway because it’s so delicious. I miss the pizza from Italy and the South of France. And a veal liver, a tartar, confit, duck breast marinated in honey… You can get a lot of really good food for a really great price in France. And the markets. You go every Wednesday, every Saturday, there are so many small farmers that bring their products into the city to sell: the guy who just milked his cows and has brought in the milk, or has made cheese from his goats' milk. I eat too many burgers here! I haven’t cooked as much since I started the business, but I do killer pizza.